Daisies are so bright and cheerful – and you’ll want to crochet an entire bouquet when you see how easy this pattern is to make. There is no set gauge; change the weight of yarn and you’ll change the size and scale of the flower, so use up your scrap yarn or choose whichever one works best for you. I used a variegated yellow and white yarn for this sample, but you could crochet the center in yellow and do the popcorn stitch petals in white – or make painted gerbera style daisies using a whole range of different colors (which happens to be on my personal To-Do list, partly because I have some very pretty leftover yarns that I need to use up but mostly because I think this pattern would be stunning in different colors). The center of this daisy flower looks fine as is, or you could sew on a small crocheted circle, a pretty button or pompom. your choice of yarn: worsted, finger weight, baby weight, crochet cotton etc. Ch. 3, join to make a ring. Row 1: Ch. 3 (counts as 1 dc), 11 dc in ring, join. Row 3: Work 12 popcorn stitches in every other dc all around. Popcorn stich: 9 trs in same stitch, remove hook and join first and last tr with ss. Ch. 3. Row 4: This row is worked on the back of the flower. *Ch. 4, 1 tr in Ch. 3 space, 1 tr in join of tr petal. * Repeat * all around, join with ss in 3rd chain. Break yarn leaving an eight inch string, work yarn loosely in and out of the tr stitches and tighten like a draw string to complete the back. 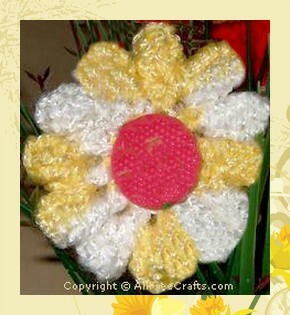 Complete the flower by sewing on a small crochet circle (repeat row 1), pompom or button.